Berlin – just the name of the city invokes images filled with war and peace, division and unity, a dark history and a bright future. One of the most visited cities in Germany and in Europe, Berlin is huge. Planning a trip to Berlin for only 72 hours can be a strenuous task, especially if you’re a first timer. 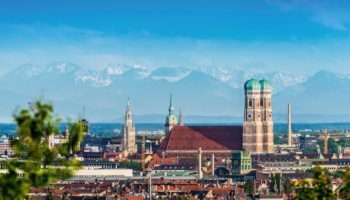 Don’t try too hard though, for no matter how much you try, it is one of those cities that you will most likely come back to to explore more of its fascinating sights. One of the easiest ways to not lose too much time is to divide the city into sections and explore them one by one. You can also take an organized Berlin Walking Tour to experience the highlights of the city and learn about its history (and maybe some hidden gems). Alternatively, you can rent a bike (for around €9 a day) and save a lot of time and money and keep your fitness in check while you cycle around Berlin – a city perfect for safe cycling. A good way to save on some euros is to buy a city pass. There are three options – the Berlin Pass, the Berlin Welcome Card, and the Berlin City Tour card. Information on all of them can be found easily online, so you can decide which one suits you the most. Also, if you are a great lover of art and museums, you could buy a ‘museum pass’ that gives you access to tons of museums around the city. What better way to start your first day in Berlin than taking the morning to explore Mitte – the city’s first and the most central borough. 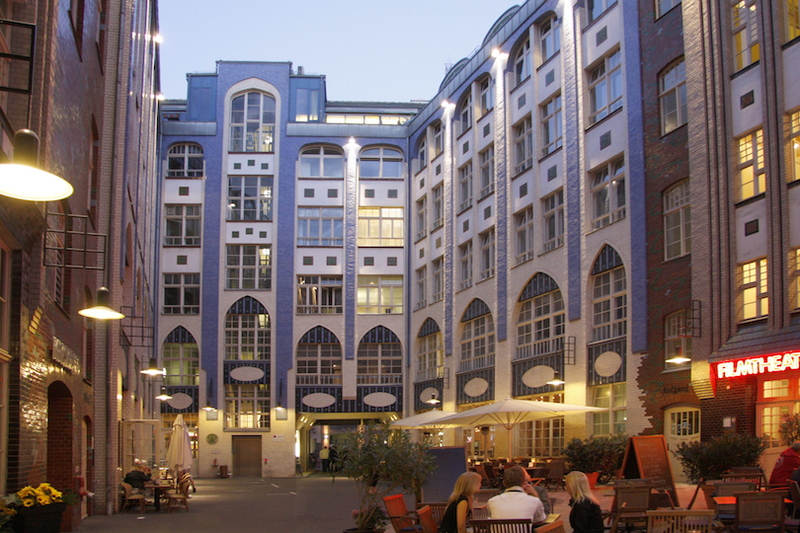 The borough is truly the historic core of Berlin and comprises some of the most historic sights of the city. Begin your day by making your way to the gigantic World Clock at Alexanderplatz. Take a moment to appreciate everything around you and then walk up to the TV Tower – with a Berlin Welcome Card, you get discounted admission tickets for the tower. 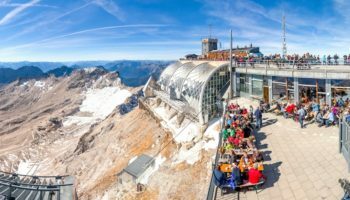 This will be a good time to enjoy a breakfast or a brunch at the Restaurant Sphere that towers 200 meters (660 feet) above the city. After your feast, continue towards and past the Rotes Rathaus (the Mayor’s office) and visit Nikolaiviertel, the oldest district in Berlin. 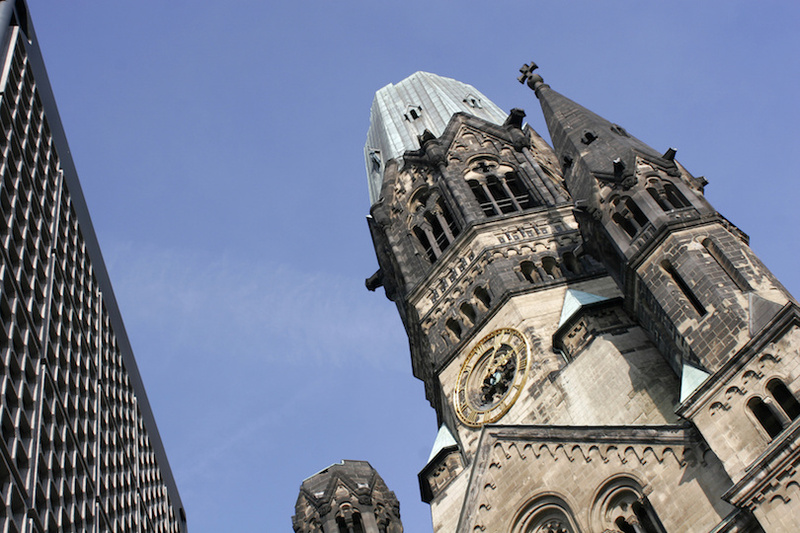 Take time to pleasantly stroll around the neighborhood and visit St. Nicholas’ Church – you get free entry with the Berlin museum pass but otherwise it costs €5 for entry. Alternatively, you can skip the Church and visit the Berlin Cathedral instead – this one you shouldn’t skip. The most significant Protestant Church in the city, the Berlin Cathedral is most notable for its iconic dome. You can get in for €7 or get discounts if you have a pass. 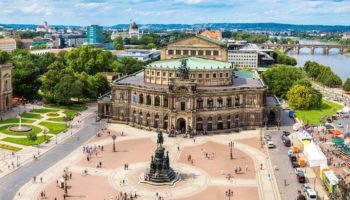 Then make your way to Museum Island, the next attraction for the day. A top site for museum and art lovers, the island comprises of five museums – all equally notable and popular. Explore them all or visit a couple to get immersed in the beauty of everything that the museums offer. 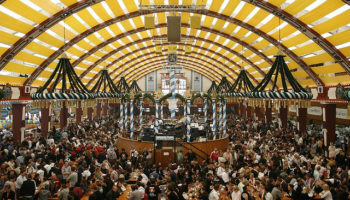 You must be famished with all the walking or biking around, so it’s time that you sit down for a nice German lunch. We recommend the German sausages for a real Berlin speciality. 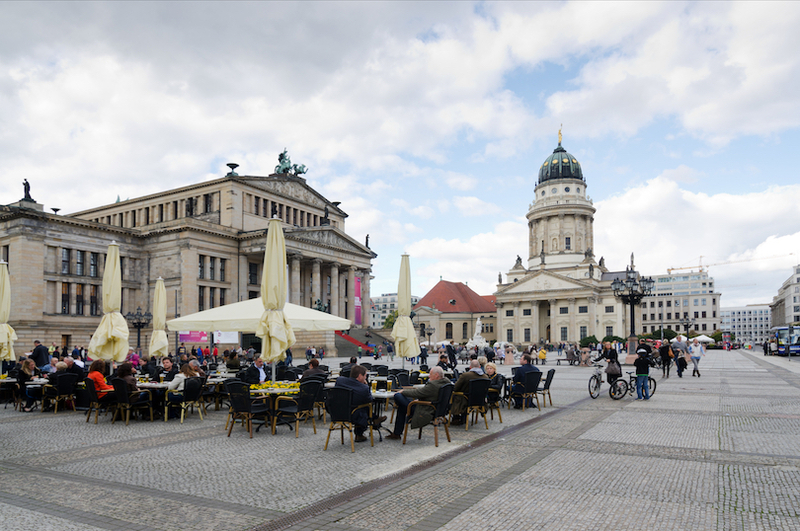 Then head over to Gendarmenmarkt, undeniably the most outstanding public square in Berlin. The area is sprinkled with architecturally brilliant structures, shopping avenues, and a lot of restaurants. The region is also known for its stunning Christmas market, so if you’re visiting in the festive season, it’s a great place to be. Spend some time around the area and afterwards make your way to the Holocaust Memorial. Walk around the maze-like 2,711 concrete pillars and try not to get yourself lost! It’s also important to remember the thousands of lives that were taken at this tragic moment in history. 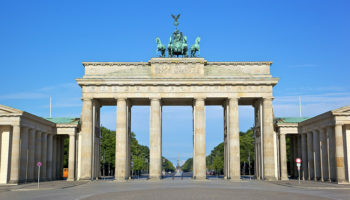 From here, it’s just a few minutes’ walk (or a couple of minutes by bike) to Brandenburg Gate – Berlin’s most significant landmark. Take your time exploring the enormity of the structure and also admire Victory Column in the distance. Nearby, and not to be missed, is the historic Reichstag, the seat of the German parliament. The glass dome at the top of the building provides a magnificent view of Berlin. Keep in mind that you need to register online in advance for a set time to enter it. At this point, it is quite normal to feel dizzy with a history and architecture overload from what you have explored throughout the day. So, depending on how exhausted you feel, you can either take a bus or walk back towards the other side of the Spree (or you can ride your bike) and finish your first day at the happening streets of Hackescher Market. 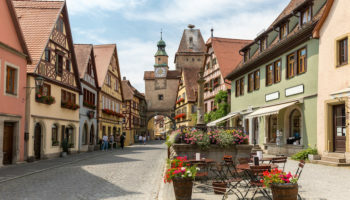 Grab a German beer while you’re there (no way can you leave Germany without sampling the overwhelming array of German beers), get some food, and maybe practice your German language skills with the friendly locals. So, you have covered many of the important sights on your first day, but, in Berlin, there is always something more to see. 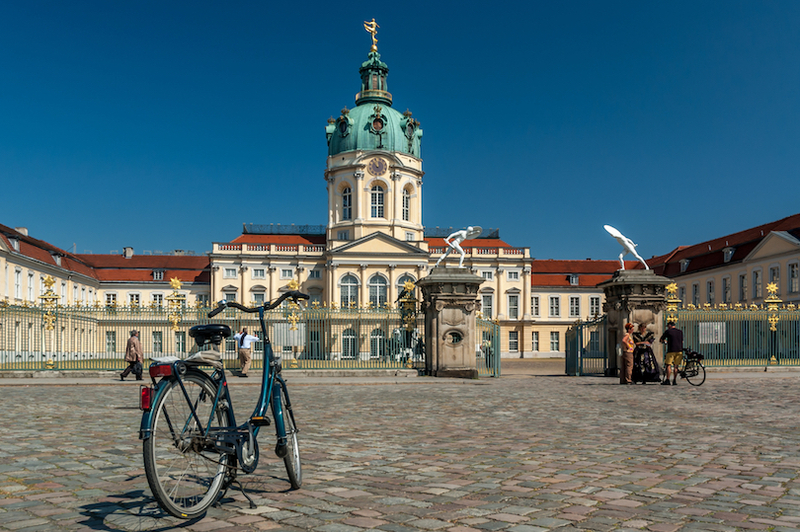 Get a good breakfast and a cup of coffee and then head straight to Charlottenburg Palace – this is where you begin your day in true German royalty style. Once a summer palace, the compound is regarded as one of the most gorgeous palaces in Berlin, helped so by the magnificent gardens that surround it. 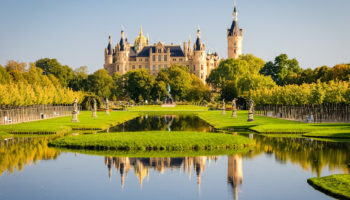 Take a pleasant walk back into the era of the Prussian Kingdom. 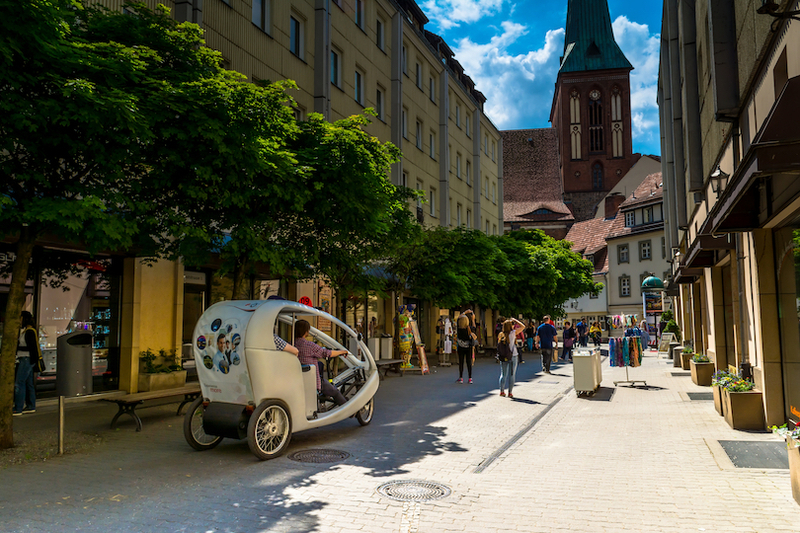 Cycle for 10 minutes to get to Kurfürstendamm – the most famous shopping district in Berlin. This will be a great destination to shop around for some branded luxuries and souvenirs, and also a good time to grab some lunch at the many eateries offered here. At the end of the street is the Memorial Church (officially the Kaiser-Wilhelm-Gedächtniskirche) – the compound consists of the ruins of the church that was destructed during the war and was re-built post-war as a symbol of peace and harmony. Nearby the church you’ll find the Europa Centre – the oldest shopping avenue in the city (you can skip this if you feel you already shopped enough at Ku’damm). Walk for 10 minutes (or bike for 5) and make your way to the Berlin Zoo and Berlin Aquarium, considered as the world’s largest public aquarium. Watch the adorable pandas roaming around the Chinese music pavilion or admire the massive underwater species’ collection at the aquarium. Keep in mind that while the Aquarium is open every day until 06:00 PM, the Zoo closes at 04:30 PM during winter months. The best way to enjoy the city of Berlin is to sightsee in the day and keep your evenings strictly for wining, dining and socializing. 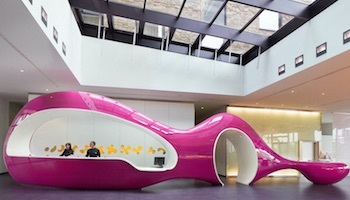 So, since you are in City West, let’s make the most out of your second night. Right outside the zoo is the famous Monkey Bar, a great spot for some beer, cocktails and making new friends. The Bar offers picturesque views of the Tiergarten district and would be a great way to end a perfect day. 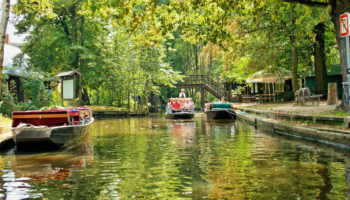 Alternatively, head over to Schleusenkrug Beer Garden, perched atop the Landwehr Canal in Tiergarten. It has been a good first two-days in Berlin and unfortunately, it is now the last day of your trip. But head up, let’s start the day with a nice, big brunch around the Landwehr Canal and head over to the first sight of day three. 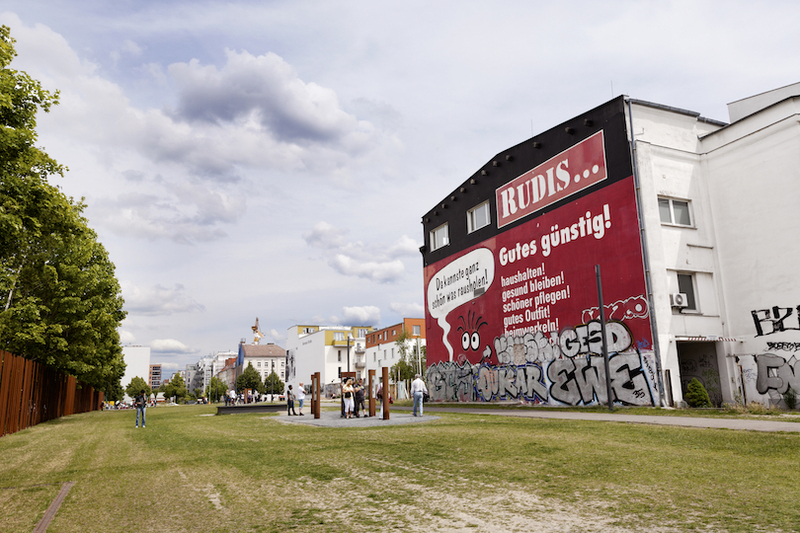 The Berlin Wall Memorial is where the actual Berlin Wall once stood, but now the memorial houses the last remaining piece of the historic wall which is covered in intriguing graffiti art. Alternatively, you can pre-purchase a guided walking tour that takes you through the significant highlights and attractions from the Cold War. 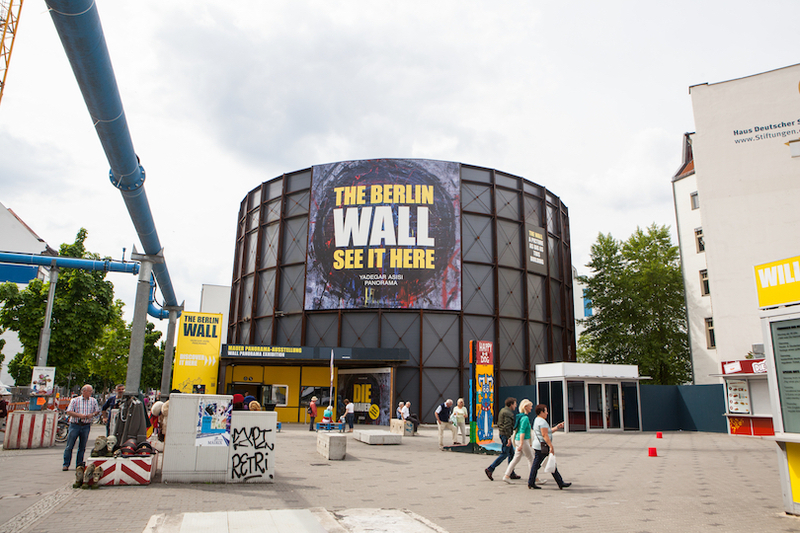 Expect to walk around the Berlin Wall Memorial, the East Side Gallery, Oberbaumbrücke, and of course, Checkpoint Charlie – the famous checkpoint that separated East Berlin from the West during the Cold War. You’ve been overloaded with so much Berlin history by now, take a break and replenish yourself with some tasty food. The area around Checkpoint Charlie is crowded with lots and lots of restaurants and fast-food joints. So take your pick and sit down for a hearty German lunch. You can spend the rest of your afternoon exploring the Checkpoint Charlie Gallery which displays some mind blowing and heart wrenching photography taken during the long Cold War. 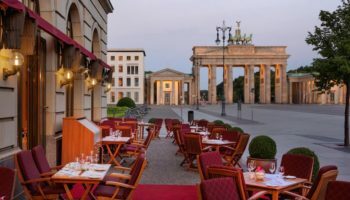 Then chill out by spending some time at the city’s popular West Berlin Coffee Shop to enjoy a good coffee of your choice while watching Berlin city life go by outside. 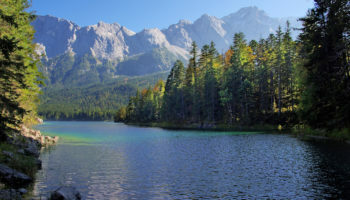 Berlin is renowned for its history, but it is also known for its nightlife and live music scene. So, since this is your last evening in the city, it makes sense that you spend it at one of the best venues for live concerts, no matter what time of the year you are visiting – the Tipi am Kanzleramt Theater. Don’t be fooled by the circus like exterior, the theatre has some great reviews for their cabaret shows, dinners, and the lovely terrace bar.